For many years, Mozambique’s international reputation was marred by civil war and natural disaster. Now, nearly a quarter of a century after the end of its most notorious conflict, the country is emerging as one of Southern Africa’s most rewarding tourism destinations. It is full of remarkably untouched wilderness areas, ranging from lush game reserves to sun-drenched tropical islands. The capital, Maputo, is a cosmopolitan city defined by its European architecture and diverse people; while cuisine all over the country is influenced by Mozambique’s Portuguese heritage. Here are eight of the best ways to spend your time there. Mozambique’s history is as fascinating as it is tumultuous. From approximately 1500 to 1975, the country was a Portuguese colony; and for several centuries before that, it was frequented by traders from Arabia, India, China and beyond. 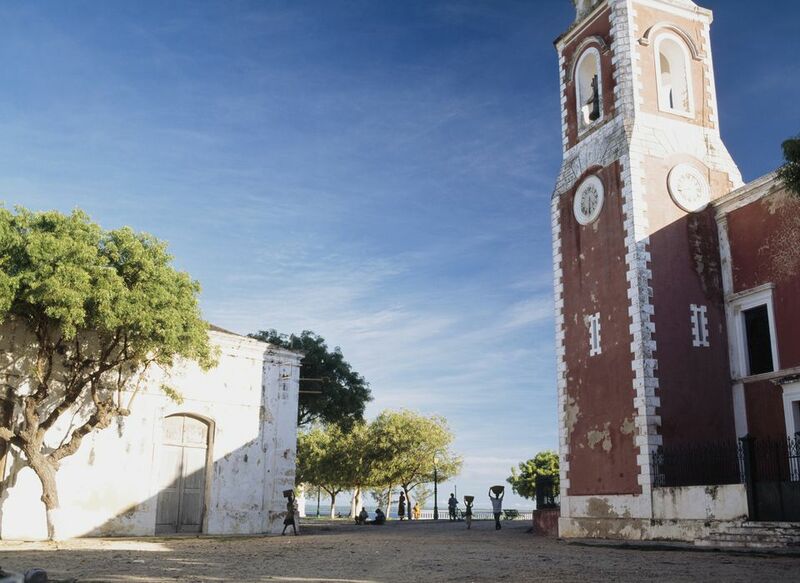 Each of these cultures have left their mark on Mozambique — and especially on Ilha de Moçambique, an island connected by a bridge to the country’s north coast. The island served as the capital of Portuguese East Africa until 1898. Now, it is a UNESCO World Heritage Site, recognized for the importance of its historic colonial architecture. Notable buildings include Fort São Sebastião, built in 1558; and the Chapel of Nossa Senhora de Baluarte, which was completed in 1522 and is now considered the oldest European building in the southern hemisphere. In the Quirimbas Archipelago, Ibo Island also offers the opportunity to explore crumbling mosques, churches, forts and cemeteries. For many visitors, Mozambique is all about the ocean — after all, its coastline stretches for an astonishing 1,550 miles/2,500 kilometers. If you have an interest in exploring beneath the waves, it’s also a great place to learn to scuba dive. In particular, Tofo Beach in Inhambane Province is known for its world-class scuba diving and offers a good choice of different dive operators and training organizations. The conditions here are generally excellent for beginners, with warm water temperatures (72 - 82ºF/22 - 28ºC), limited current and good visibility. Course prices are reasonable too, with an entry level course costing $420 on average (compared with rates of $500+ in the United States). The best reason to take the plunge at Tofo, however, is the marine life. The surrounding reefs are jewel-bright with colorful fish and corals, while the area is known worldwide for its resident populations of whale sharks and manta rays. Other scuba hotspots include the Quirimbas and Bazaruto archipelagoes, Ponta do Ouro and Guinjata Bay. If you’re already a certified diver (or anyone with an interest in paradise island living), make a beeline for one of Mozambique’s offshore archipelagoes. In the south, the Bazaruto Archipelago comprises six idyllic islands; and in the north, the Quirimbas Archipelago is a treasure trove of 32 islands. Areas of both are protected as Marine National Parks and the scenery is a catalogue of swaying palms and white sand beaches painted in swathes across the turquoise sea. Many of the islands and islets are uninhabited or provide temporary homes for nomadic fishermen. The channels between them are plied by traditional dhows and dugout canoes and the opportunities for snorkeling, scuba diving and simply lazing on the beach are endless. Both archipelagoes have a selection of luxury lodges tailor-made for an indulgent getaway — try Situ Island Resort in the Quirimbas or &Beyond Benguerra Lodge in Bazaruto. Ponta do Ouro is known as one of the best places in the world for ethical dolphin encounters. Located in the far south of the country near the South African border, it's home to a resident population of bottlenose dolphins. Local conservationists have been studying and working alongside them for two decades, slowly habituating them so that people are able to interact with them safely in their natural environment. Several companies offer dolphin tours but the original is Dolphin Encountours. This operator follows a strict code of conduct that keeps the experience positive for the dolphins. They also use money from the tours to fund ongoing research and conservation work. You can sign up for a one-off snorkeling tour or increase your chances of success with a three-day launch package. Because the dolphins are wild, there are no guarantees - but if you do get to swim alongside them, it's an experience you will never forget. Other possible sightings include spinner, spotted and humpback dolphins and humpback whales in season. With the Mozambique Channel offering perfect conditions for bucket list species including sailfish, marlin, tuna and dorado, Mozambique is a deep sea fisherman’s paradise. The water is warm and dramatic underwater topography creates the nutrient-rich upwellings to which hunting pelagics are irresistibly drawn. Some of the best places to fish are in the Quirimbas and Bazaruto archipelagoes; but the legendary status of St. Lazarus Banks is hard to beat. Located approximately 55 miles/90 kilometers offshore, the banks can only be reached by charter boat, usually on a multi-day liveaboard trip. Strong currents and plentiful food attract trophy-sized fish ranging from giant trevallies to dogtooth tuna, with the peak season running from August to the end of April. Be sure to choose a charter with a catch and release policy, as Mozambique (like most coastal countries) is becoming increasingly affected by overfishing. Mozambique’s plentiful coastline is also the inspiration for its national cuisine, with seafood featuring prominently on menus around the country. Whether you dine at a five-star resort or a roadside shack, you’ll have the opportunity to sample fish, calamari and octopus, while prawns are the most iconic Mozambican dish along with galinha asada or barbecued chicken. Both are often marinaded in piri-piri sauce (Mozambique’s most famous export). Other key ingredients include coconut, cassava and cashews. Portuguese influences are evident in many dishes, including rissóis de camarão (shrimp-filled croquettes) and dobrada (a tripe stew served with potatoes, onions, tomatoes and chillies). Whatever you go for, don’t miss out on paõ, a Portuguese-style bread roll best bought fresh from early morning markets. Mozambique's top beer brands are 2M and Laurentina, while local tipo tinto rum is best paired with raspberry in a drink known as R&R. While most safari enthusiasts head south to South Africa or north to Tanzania and Kenya, Mozambique is also home to its fair share of impressive reserves. The jewel in the country’s wildlife crown is Gorongosa National Park, a reserve that has recovered admirably after the poaching epidemic brought on by civil war. Located at the southern end of the Great African Rift Valley, the park’s floodplains are now a haven for lion, elephant, hippo and antelope. Also in the north of the country is Marromeu National Park. This coastal reserve harbors the highest density of waterbirds in Mozambique, including rarities like the African skimmer and the wattled crane. In the south, the impending Great Limpopo Transfrontier Park will connect several of the greatest wildlife areas in Mozambique, South Africa and Zimbabwe, creating a super-park measuring 13,500 square miles/35,000 square kilometers. In the northwest of the country, Lake Niassa (or Lake Malawi as it’s known by the rest of the world) spans the borders with Tanzania and Malawi. It’s the ninth largest lake in the world and supports more fish species than any other lake on Earth. Of these, the most famous are the cichlids, colorful freshwater fish with an astonishingly high rate of endemism. Christened the "Lake of Stars" by explorer David Livingstone, the Mozambican section of Lake Niassa is unspoiled and remote. Adjacent Niassa Game Reserve is home to abundant wildlife, including more than 10,000 elephants and the critically endangered African wild dog. It’s also a sanctuary for endemic ungulates including the Boehm’s zebra, the Johnston’s impala and the Niassa wildebeest. Luxury lodges like Mbuna Bay Lodge and Nkwichi Lodge invite travelers to experience the best of the lake through a range of water-based activities.